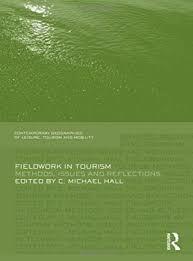 245 0 0 %a Fieldwork in tourism : %b methods, issues and reflections / %c edited by C. Michael Hall. 260 %a Milton Park, Abingdon, Oxon ; %a New York : %b Routledge, %c 2010. 300 %a XIV, 322 s. : %b il. ; %c 23 cm. 490 1 %a Contemporary Geographies of Leisure, Tourism and Mobility.